This entry was posted in church activities on 29 March, 2019 by thomascalleddidymus. Welcome to Calvary Church, Brighton, UK! This entry was posted in Miscellaneous on 4 July, 2013 by thomascalleddidymus. Pastor was invited back to Sri Lanka again this year. It was unfortunately not possible to arrange in advance to visit Baldaeus Theological College. 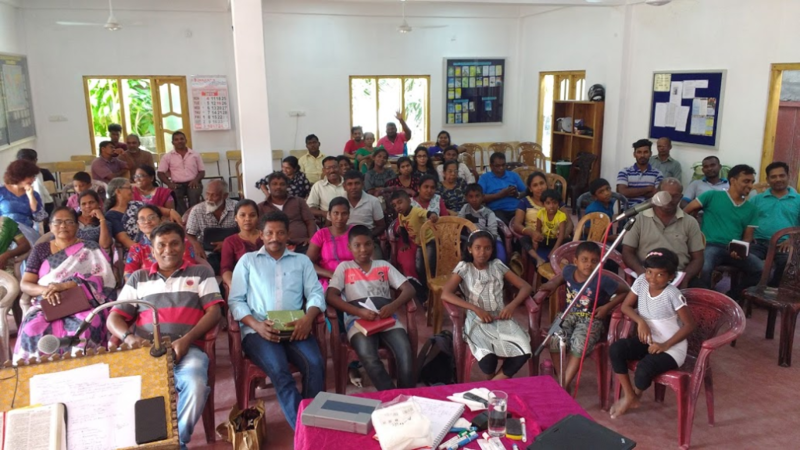 But he was able to visit two churches in Mannar – Grace and Truth Fellowship Church, and Gospel Grace Church. He attended prayer times at GTF, and spoke at a joint study day on the book of Isaiah held by both churches. He spoke at a combined conference Monday -Thursday on the same subject. Later he went on to speak at the holiday camp / weekend away of Grace Evangelical Church, Colombo. This entry was posted in church activities on 1 April, 2019 by thomascalleddidymus. On 28th April 2018 we had a celebration to mark 55 years of Christian service rendered by Ray Wingate. Ray had served on the Railway Mission Advisory Committee, then, following Pastor Les Hill’s teaching on Church Government as a Deacon. He served as Youth Coordinator, then as Church Secretary, then additionally as Church Treasurer. The value of service is not always seen “up front” in the church of Jesus Christ, but often “behind the scenes”. Thank you to Ray for such sterling service. Many old friends came along to the afternoon. A framed print was presented to Ray in appreciation. It was a lovely time for which we thank God in very many ways. This entry was posted in church activities on 5 May, 2018 by thomascalleddidymus. We spent a very useful morning reviewing how God had led us and the previous congregations going back to 1872. Chris Fry gave a conducted tour of the buildings, and pointed out the effort initiative and gospel motivation of the original builders and inhabitants of the premises. He showed how enlargements had taken place to make space for the people God had brought in. We also visited the rooms currently leased by the Brighton and Hove City Mission, in their service for God. Philip Wells brought a session of teaching on church membership and reflection on the recent history of the church. This entry was posted in church activities on 30 September, 2017 by thomascalleddidymus. We spent the past week in prayer to the Almighty to bring our desires, hopes, aspirations, uncertainties, and burdens to him in prayer. We met for about an hour each morning, and for more than an hour each evening of the week. The meetings were well attended. At one meeting half the people there were, in person, answers to prayers prayed last time we had such a week – in 2014. May God go on to answer more prayers in 2017 and 2018, for his glory! This entry was posted in church activities on 23 September, 2017 by thomascalleddidymus. 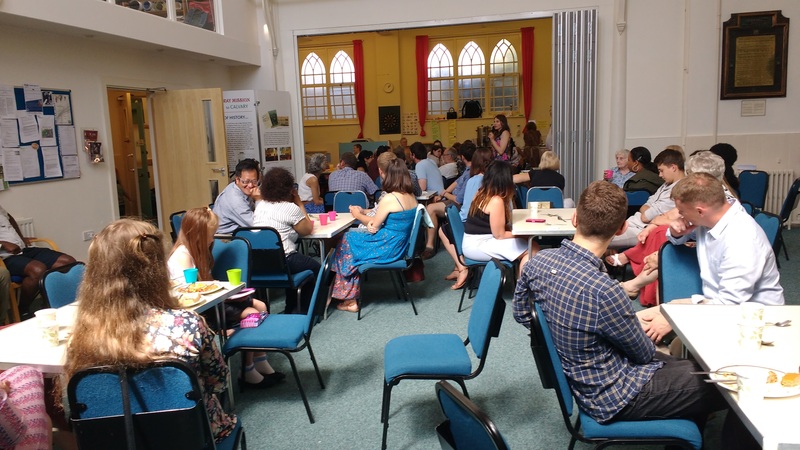 A time of young people volunteering to give time with the United Beach Missions (UBM) organisation spent a week in Brighton based at Calvary Church, and Ebenezer Church. They went out each day to befriend internationals and others and to seek opportunities to talk about Jesus. There were many interesting conversations. People from this country often overlook how radical and amazing is the Christian message. It says that the God who made all things and us came to earth and died a horrible death to atone for our sins and remove our shame and disgrace. This entry was posted in church activities on 12 August, 2017 by thomascalleddidymus. This morning’s service was very special in many ways. During this meeting we witnessed the baptism of Penny Armstrong and Maciek “Mat” Kawczak in the name of Jesus. 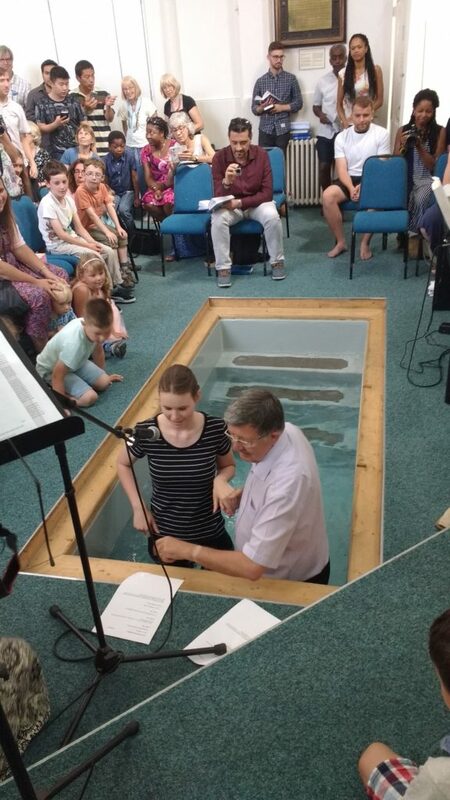 We heard moving testimony of how Penny turned to the Lord after suffering much bullying at school, and – in contrast – security and understanding among the fellowship of God’s people. Matt told us about the witness he had received from good Polish friends – including some people who were present at the meeting. We had a bring and share lunch. 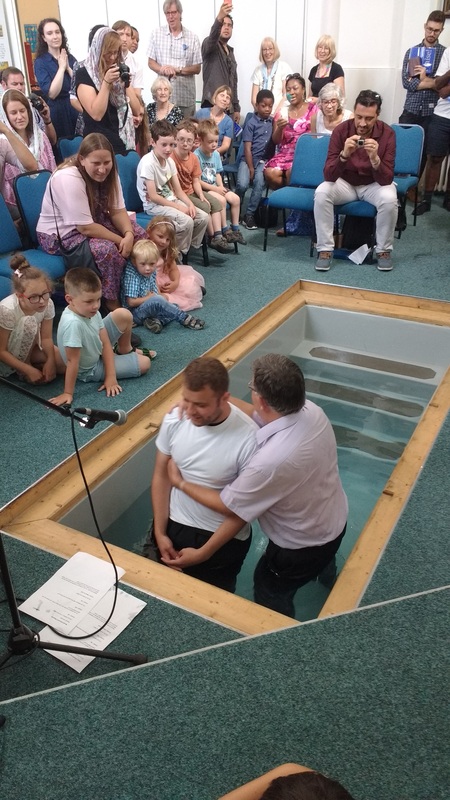 Afterwards people were invited to tell everyone their response to the baptism. Polish friends gave warm words of encouragement to Matt. We thank God for his work in these dear people’s lives. This entry was posted in church activities on 13 July, 2017 by thomascalleddidymus. Please note – this will replace the evening meeting of Calvary Church on June 4th 2017. This entry was posted in church activities on 20 May, 2017 by thomascalleddidymus.